Dry rot is another one of those old house problems that terrify the life out of people, and like woodworm is often misdiagnosed and treated incorrectly. The description "Dry rot" is incorrectly used by many, as an all encompassing description, of what are varies types of rotting timber. Dry rot is actually a very specific fungus "Serpula lacrymans" and is generically a "brown rot" type fungus. There are however many other far more common types of timber decay/rot, which is generically be called wet rot. That may sound irrelivent to many people but it involves quite different levels of response. 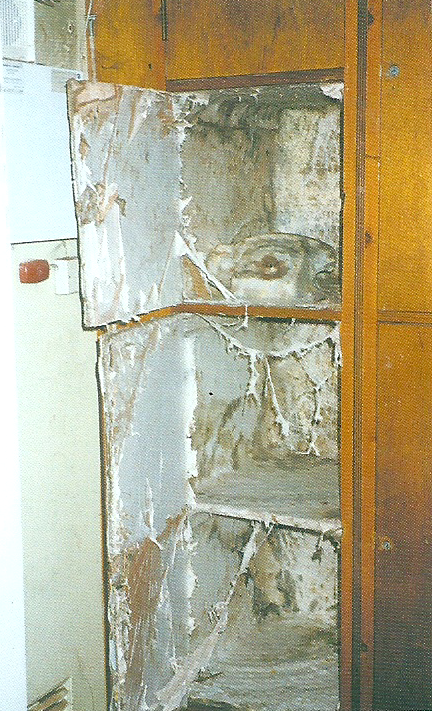 Dry rot is however certainly one of the most virulent of fungus rots and has to be dealt with carefully if it is not to re-occur. Wet rot occurs wherever timber is exposed to a constant source of moisture, dry rot occurs where it is exposed a constant source of moisture AND where the spores of the dry rot fungus are present. 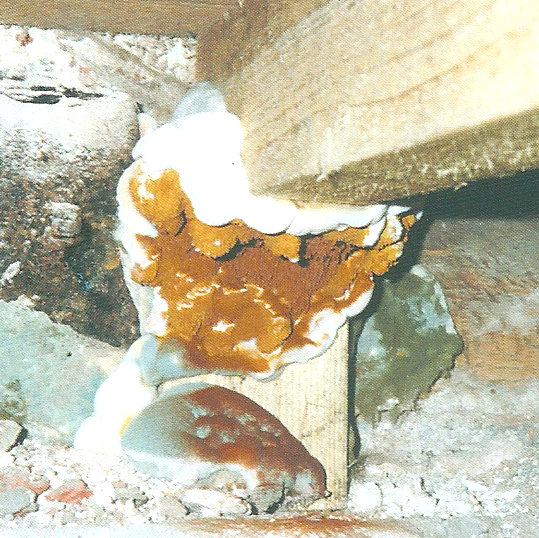 Most specifically dry rot thrives under conditions where it is both damp and warm, a situation that is more likely to occur after "improvements" have been made, especially the installation of inappropriate insulations, such as dry lining and insulation in suspended timber floors, which typically create warm damp environments. The most reassuring point to remember is, and this is a biggy, once the source of moisture is eliminated, then the dry rot fungus will die, the necessity to inject or flood masonry with chemicals is, in 95% of cases, unnecessary. From a conservation perspective the other "treatments" typically proscribed by the remedial industry are very destructive and also largely unnecessary. This includes the "cutting back" of all timbers within a meter of any dry rot, the wholesale removal of plaster within 1.5 meters of rot and the drilling of holes for the purpose of introducing chemicals into the masonry, these methods result in a colossal destruction of the original fabric of the building. Regrettably as in the Woodworm treatment, most of the building industry's representatives (outside the conservation professionals at least), I.E. the regular builders, architects, surveyors and engineers have largely left the diagnoses and treatment of Dry rot to the remedial industry, who certainly have a direct conflict of interest in that they are usually asked to both diagnose and treat the problem. It could also be said that most would have little interest, knowledge or concern for the preservation of original historic fabric of a building. As a result the wholesale removal or chemical treatment of masonry and timbers is often the result, along with the destruction of original fabric. 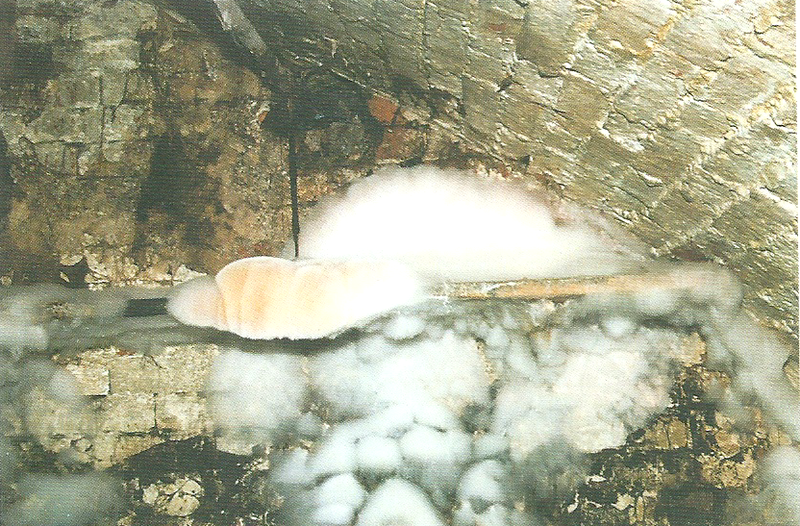 In a large landmark church, some deformed timber and mycelium (strands of the dry rot fungus that are sent out to look for more wet timber), a remedial company was called in who proscribed the removal of large 200 year old roof timbers, after an expensive repair to the roof structure and replacement of slates, they then proceeded to the removal of lime plaster but luckily before they started to demolish a large section of an elaborate decorative cornice work, the building manager noticed that the exposed wall under the plaster was completely dry and the manager decided to call in this conservation expert, who quickly established that the mycelium was dead and ascertained from the buildings historical records that this section of the roof had been repaired before, 200 years before to be precise... so the remedial company was busy treating dry rot that had been dead for 200 years. There are quite simple testing methods to determine if mycelium strands are active, but you would be surprised how few in the industry perform any tests or even know the methodology for doing so. So if you suspect dry rot, call a conservation expert not a remedial company, if you want an independent analysis. If you have a rot problem, please call us to discuss what we can do for you, please also consider using our CONSULTATION service, we don't offer you a free survey, but we do offer you our 35 years of experience in dealing with these problems..